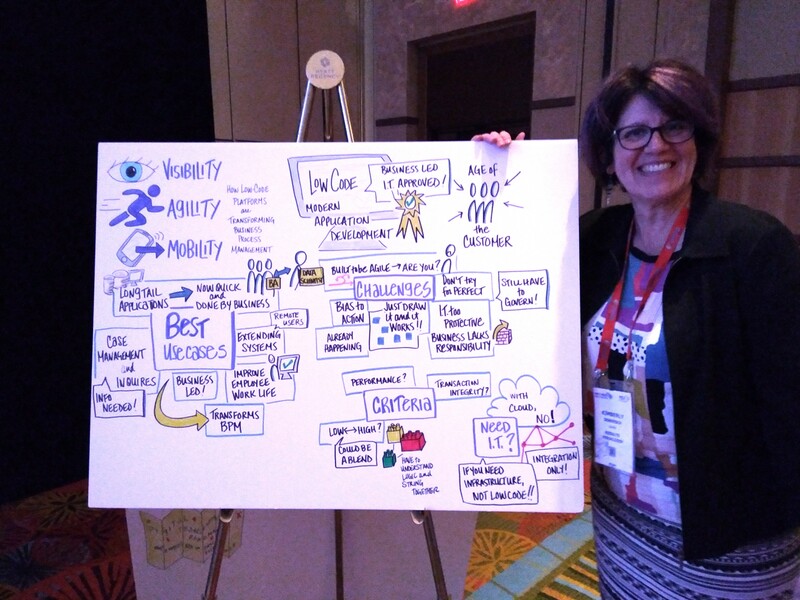 I only had 1.5 days at OPEX Week 2018 in Orlando this week, and spent part of my time giving a presentation as well as sitting on a panel, so didn’t attend many sessions. However, I struck up a conversation with Eric Thompson at the reception last night without realizing that he was one of the original co-founders of Lombardi Software — now a part of IBM, with the Lombardi BPMS forming a good part of the core of IBM BPM — and had such an interesting talk that I sat in on the presentation that he did today with Doug Drolett about continuous improvement at Shell. Both Thompson and Drolett have senior CI roles at Shell. Shell has been working on process improvement for more than 10 years, with business-centric process improvements during 2005-2009, moving to more end-to-end global process improvement during 2010-2013, and now focused on continuous improvement to the way that everyone works. Although driven from the top, with the CEO fully engaged, the idea is that it’s an ongoing cultural shift at every level. As they moved to this mindset, it became less about programmatic improvement (rolling out new systems to improve the business processes) and more about how that embedded culture impacts operational excellence. This results in everyone being focused on delivering value to the customer — however the customer is defined — through a perpetual cycle of plan-do-improve. They talked about improving the order-to-cash process in their commercial business, and how they improved that process on a global scale including standardization. They use customer journey mapping and “thinking like the customer” extensively to determine how and why to deliver value in those processes, which has an interesting tie-in with the session that I gave yesterday on how customer journey mapping and process improvement fit together. They also use value stream representations of customer-facing processes, and owners for those processes. Their front-line staff include Lean practitioners, with a smaller number of CI coaches to overlay on ongoing initiatives and projects. Since they’re a global operation, they use technology to enable collaboration so that a single CI initiative can involve participants from several countries.